Simple Lipids are esters of fatty acid with farious alcohols. They constitute about 98% of total dietary lipids ; the remaining 2% consists of phospholipids and cholesterol and its esters. They are the major components of storage or depot fats in plant and animal cells but are not normally found in membranes. They are nonpolar, hydrophobic molecules since they contain no electrically charged or highly polar functional groups. In animals, the fat cells or adipocytes contain very large quantities of triglycerides in the form of fat droplets, which fill almost the entire cell volume. Adipocytes are abundantly found under the skin, in the abdominal cavity and in the mammary glands. 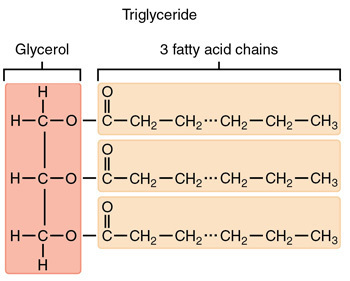 Triglycerides can be stored in quantities, sufficient to supply the energy needs of the body for many months, as in the case of obese persons. Most fats and oils, upon hydrolysis, yield several fatty acids as well as glycerol. In a normal man, weighing 70 kg, at least 10-20% of the body weight is lipid, the bulk of which is triacylglycerol (TAG). Most animal fats such as those from meat, milk and eggs are relatively rich in saturated fatty acids but contain a rather low content of polyunsaturated fatty acids; two exceptions are chicken fat and fish fat. The plant fats contain a large proportion of unsaturated fatty acids (esp., polyunsaturated). The unsaturated fatty acids have low melting point and confer liquid state to the plant fats. A saturated fat consists of fatty acids with no carbon-carbon double bonds. An unsaturated fat has a double bond while a polyunsaturated fat has multiple double bonds. Biological waxes are esters of long-chain (C14 to C36) saturated and unsaturated fatty acids with long-chain (C16 to C30) alcohols. Their melting points (60 to 100 C) are generally higher than those of triacylglycerols. Waxes are unusually inert due to their saturated nature of the hydrocarbon chain. They can be split slowly with hot alcoholic KOH. They are insoluble in water and highly resistant to atmospheric oxidation. Most of the waxes are mixtures of esters. Biological waxes find a variety of applications in the pharmaceutical, cosmetic, and other industries. Lanolin (from lamb’s wool), beeswax, carnauba wax (from a Brazilian palm tree), and wax extracted from spermaceti oil (from whales) are widely used in the manufacture of lotions, ointments, and polishes. The shiny leaves of holly, rhododendrons, poison ivy, and many tropical plants are coated with a thick layer of waxes, which prevents excessive evaporation of water and protects against parasites.